Texas Instruments has introduced two families of CAN FD transceivers. They meet industry requirements for electromagnetic compatibility (EMC) from US and European automotive manufacturers. 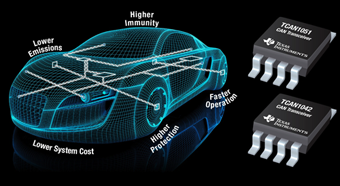 Delivering bus-fault protection and CAN flexible data rate (CAN FD) speeds, the TCAN1042 and TCAN1051 CAN transceiver families provide a combination of protection and high performance for a variety of automotive and industrial applications. The transceivers comply with EMC standards from international organizations: 16 devices are qualified by the Automotive Electronics Council (AEC) Q100 and meet EMC requirements for automobile manufacturers in the US and Europe. Eight industrial devices meet the requirements of the Comité International Spécial des Perturbations Radioélectriques. The devices eliminate the need for an external noise-suppressant common-mode choke component, thereby reducing bill-of-materials cost and space in automotive and industrial designs. The bus-fault protection up to 70 V exceeds 12-, 24-, and 48-V battery requirements, in addition to protecting against 24-VDC industrial power supplies. This protects CAN pins against short-to-DC voltages. The ESD (electrostatic discharge) protection up to ±15 kV eliminates the need for external transient voltage suppression diodes. A CAN FD speed of up to 5 Mbit/s increases the communication speed and data-transfer capability between electronic control units and nodes on the CAN network. The loop delay of 175 ns enables bigger margins in the system design, longer networks, and more nodes on CAN. Engineers can evaluate the performance of the TCAN1042 and TCAN1051 with an evaluation module (EVM). The TCAN1042DEVM is available from the Texas Instruments store and authorized distributors. TCAN1042 devices contain a standby mode with a bus wake-up feature and variations for fault protection, bit-rate, and level-shifting. TCAN1051 devices include a silent mode and variations for fault protection, bit-rate, and level shifting.